Creepy homeless ghost kid is sad. its from a comercial tha brings awareness to unprivileged children. Actually, I think that's one of those 3D paintings. It's only correctly visible from a precise viewing angle. That's not shopped, you retards. He's painted to look transparent from a precise angle. What exactly is there to not unsee, again? Shouldn't this be on shitbrix? Kony did a great job after all! it's actually chinese and it says "don't ignore me"
The entire thing js fake. 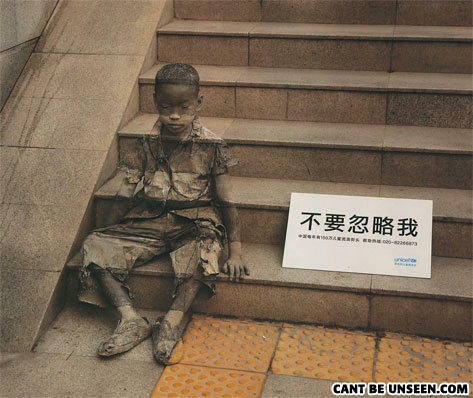 The staircaee, sign, kid, everything, is a painting, rather, a chalk Drawing. it does say "don't ignore me". This isn't a "you can't unsee it" thing. It's the same as those stupid drunk driving ads where the police are hiding in every damn shadow creeping on the drunk people walking to their cars. I can't tell if it's one of those sidewalk art things that looks 3D from an angle or if they just painted some kid. hey baby do you fart?